Jacob (Jake) Thiede is a composer, saxophonist, and current PhD student at the University of North Texas. Premieres and performances of Jake’s music have taken place in Italy and the United States, including Georgia, Hawaii, Iowa, Kentucky, Louisiana, North Carolina, Ohio, Tennessee, Texas, and Vermont. Recent honors and festivals include the Bowling Green State University Graduate Music Conference (2017), the National Student Electronic Music Conference (2016 & 2017), the Electric LaTex Conference (2016 & 2017), New Music on the Point (2015), and the HighSCORE Festival (2014). He received his BME at Murray State University and MM in music composition at the University of North Carolina at Greensboro. As a saxophonist, he has studied with Scott Erickson and Steven Stusek. Jake studies composition with Kirsten Broberg and Andrew May as well as saxophone with Eric Nestler at the University of North Texas. 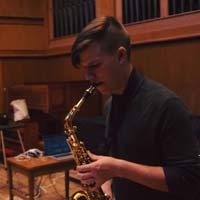 Jacob Thiede Alto Saxophone Jacob (Jake) Thiede is a composer, saxophonist and current PhD student at the University of North Te . . .